Introduce the doctrine: Have the children stand and read Doctrine and Covenants 1:38 out loud together. Explain that prophets are servants of Jesus Christ. Show pictures of the Savior and the current prophet, and tell the children that when we follow the prophet we follow Jesus Christ. Encourage application: Sing verse 9 of “Follow the Prophet” (CS, 110–11). Divide the children into groups and have them choose one or two things they learned from the living prophets and apostles during general conference. Have one group act out what they learned. Have the other children guess what they are doing. Repeat with each group, singing the chorus of “Follow the Prophet” between each group’s turn. Begin your Sharing Time by doing the Identify the Doctrine idea given in the outline by reading Doctrine and Covenants 1:38. Show a picture of the Savior and the current prophet, and tell the children that when we follow the prophet we follow Jesus Christ. Tell the children that we just listened or will be listening to the Prophet as we watch(ed) General Conference. For this activity the children will be reading several quotes from President Monson’s Conference addresses. 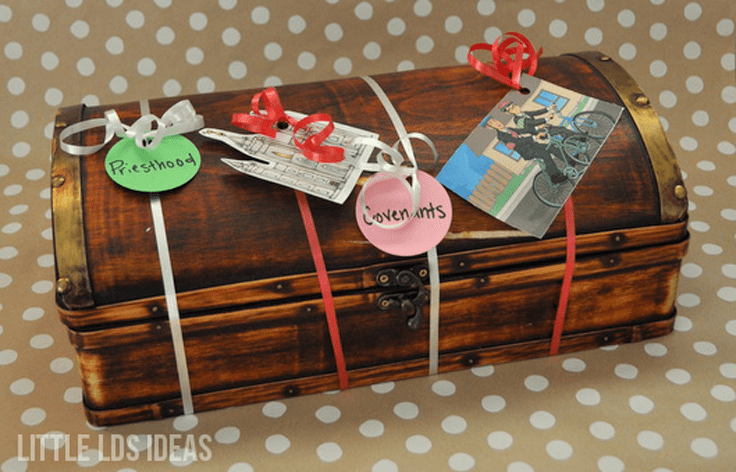 After they read the quotes they will need to find the matching key word that is tied around the treasure chest. Once they have found the matching keyword or phrase they will get to cut the string/ribbon. Once all the strings have been cut they will get to reveal the treasure! Here’s what you’ll need and How to play! As you can see in the picture above you will need a treasure chest for this activity. If you have one, great! Or just make one out of a box. Believe me, it doesn’t need to be fancy once the children know that there is a treasure inside. ? 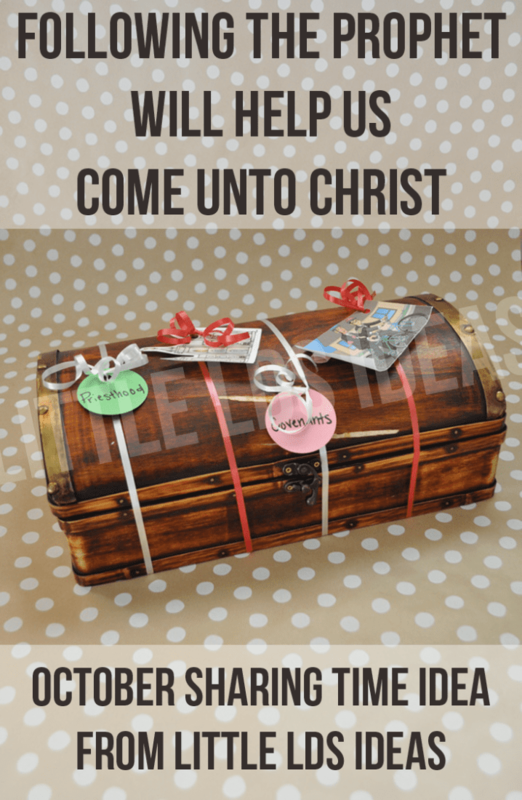 Then you can fill the treasure chest with bubble gum or some other ‘chewy’ treat. You could also use a non-food item. Then come up with a cute little phrase about following the words of the Prophet. Next, you will need to have several different quotes typed/written onto pieces of paper. Have the quotes underneath chairs, posted around the room, inside of balloons, hanging from the ceiling, inside of a punch-a-box, etc. For each quote you will need to pick one word or short phrase that describes that quote. You could also choose a picture that represents each quote. Begin by explaining that the words we hear from our Prophet at General Conference are very important and we should do our best to listen to what our Prophet says. Think of his words as a ‘treasure’. When you listen to President Monson speak you are actually listening to the words of the Lord. You can then repeat the scripture from the outline and point out what it says. Show the children the treasure chest. Explain that around the room (or wherever you have the quotes) are several different quotes/sentences from President Monson’s talk that we just heard during General Conference a few weeks ago (or from the last General Conference). Tell the children that they are going to have to find these quotes and then match them to the word that is on the treasure chest. 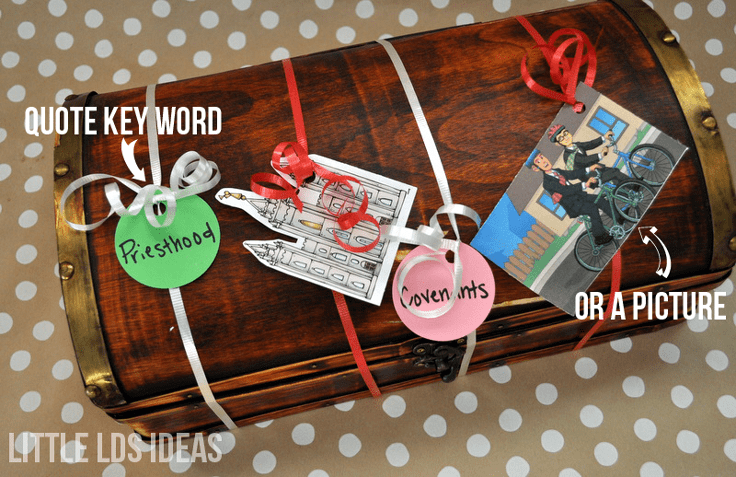 In order to open the treasure chest they will need to match each quote to the appropriate phrase/word. Invite the first child up and have them find the first quote and read it aloud. Then have them walk to the treasure chest and look at the keywords/phrases. Have them pick which phrase best matches the quote they just read. If it’s a match have them cut the string! Then continue with the next child. You can also have them attach the quote to a picture of President Monson that is displayed on a chalkboard. At the end of the lesson you could go over the quotes and what President Monson has said or asked us to do. After all the quotes have been read explain to the children that as we listen and follow the Prophet we will be blessed, and we will be rewarded with wonderful spiritual treasures! Open the treasure to reveal your treasure! Testify that President Monson is called of God, and that he leads our church under the direction of Jesus Christ, and as we follow his teachings we will come unto Christ. I hope this idea can help you out in some way. Thanks for stopping by. Have a wonderful day & a great Sharing Time! THANK YOU for sharing your gift of creativity! It inspires me. Thank you for all your wonderful ideas! I have week 2 in October. Do you have ideas posted for the rest of the Sunday Sharing Times yet? Hi Margaret! I just shared my idea for Week 2. 🙂 Thanks for the comment. That was fast and I love the ideas for the 2nd week! I can’t wait to present this Sharing Time! Thanks so much!! You are very welcome, Margaret. 🙂 Thanks for the comment.